Galls are an interesting and relatively common natural phenomenon caused by a unique relationship between certain species of insects and mites and a variety of plants and trees. Despite the fact that they are abundant and often conspicuous, very little is known about them. Generally speaking, galls are a modification of plant tissue caused by an insect or mite for the benefit of that animal. 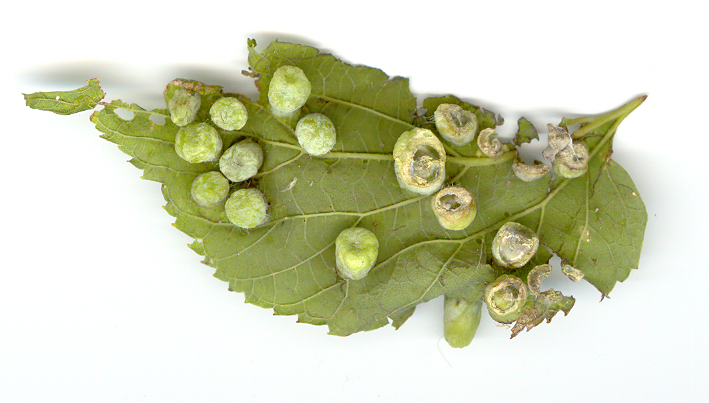 There are many different types of galls, each caused by a separate arthropod. For this reason, galls are typically not named per se, but are instead identified by the animal that creates them. Some galls range from slight rolls of the leaf to complex, multicellular cases made from leaf material. Galls can be formed from modifications of the leaf tissue, the bud, the twig, the stem, or even the roots of a plant. The process by which this modification occurs is not well known at this time. In most cases, it is suspected that the galler releases a secretion of plant growth factor, amino acid, or DNA itself through the act of eating the plant matter, from insect ovipositors, or from the gall maker's larva (the method varies with the gall maker). These secretions act on the plant's molecular signal pathways, inducing it to grow and modify the tissue into a gall. Essentially, the gall that forms from the plant tissue will be a sort of case for the maker or its larvae. I. The Nutrition Hypothesis--the gall that the animal induces serves as a richer food source than would be acquired by other feeding methods. II. The Microenvironment Hypothesis--the gall tissue is a means for protecting the galler from desiccation by providing a bath of fluids. III. The Enemy Hypothesis--Galls are protection against the galler's natural enemies. All three hypotheses probably play a role to some extent, dependent on the specific galler. In addition, galls may be triggered to form by bacterial or fungal infestation. One example of a fungal gall, Dibotryon morbosum, is included in this site. There are over 1500 worldwide species of insect and mite gall makers, or "gallers," a very small number of which are represented in this Field Guide. Because of the vast number of galls, many of which are not well-known, this guide is meant to serve merely as an introduction: it is by no means exhaustive! Additionally, the sources used to research this guide, specifically the Felt text, were quite old and often with vague photographs and descriptions. Because of this, it is possible that every gall on this site was not identified with 100% accuracy, although the site demonstrates the author's best efforts in attempting identifications. Want to know about the author of this site? Click here. About The Author: William Gynan is a senior at Brandeis University in the class of 2004. He is an English Major who has recently acquired an Environmental Studies Independent Interdisciplinary Major. Though he is very interested in the study of environmental science, he had no knowledge of plant galls prior to beginning this research. He hopes he is helpful in passing along what he's learned so far. This Field Guide was made for the Field Biology Class, taught by Professor Dan Perlman in Fall, 2003. Thanks to everyone in the class for making this site possible, and thanks to Shu-Yee for help with the compare code!